Looking forward to the Australian book launch of the Twelfth Planet Press anthology Mother of Invention, which includes my story Knitting Day, scheduled for 2pm on Sunday 10th June at Continuum Speculative Fiction Convention in Melbourne. I found the inspiration for my story last year at Continuum as I was watching a taping of the podcast Galactica Suburbia, and now here we are again this year with a wonderful book. It's like magic, isn't it? Except that there's an awful lot of hard work involved. Hard work and magic! So pleased that my story Knitting Day will be published in the upcoming anthology Mother of Invention. 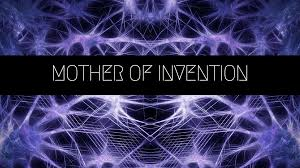 Edited by Tansy Rayner Roberts and Rivqa Rafael, Mother of Invention will be will be a speculative fiction anthology focusing on gender and artificial intelligence. The anthology will feature stories from authors including Seanan McGuire, John Chu, Nisi Shawl, Cat Sparks, Kaaron Warren, Jo Anderton, and many more. I wrote this piece in an hour, while I was also doing something else. I don’t want to denigrate the story. Rather, I’m remembering the ease at which some stories are written – particularly the shorter ones. I don’t know why I started this story, or where it came from, but I just wrote and wrote pretty much as is on the page, and finished it in 60 minutes. That doesn’t happen very often, but it does sometimes. A belated congratulations to all the Aurealis Awards winners. The winners' list has new voices as well as familiar ones,and works published both here and internationally. It feels like speculative fiction in Australia is in a very healthy state. The Aurealis Awards shortlist has just been announced. Congratulations to all the finalists. 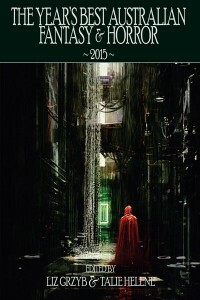 And I’m especially ecstatic to find that my story ‘The Least of Things’, published in Aurealis #94, has been shortlisted for Best Science Fiction Short Story. I feel honoured to be in such great company. Ticonderoga Publications is soon to release The Year’s Best Australian Fantasy and Horror 2015, boasting 31 fantastic stories and over 150, 000 words from Australia and New Zealand published in 2015. The collection, edited by Liz Grzyb and Talie Helene, also includes a recommended reading list, a valuable snapshot of the state of A&NZ fantasy and horror in 2015. This will be the first time an Australian Year's Best genre series has run to six consecutive single-year volumes. That’s quite an achievement. Well done, Ticonderoga Publications! The Year's Best Australian Fantasy and Horror 2015 will be available in hardcover, paperback, and ebook, in February/March 2017. The hardcover and paperback are available to pre-order at indiebooksonline. That’s quite a list. I can’t wait to get my hands on a copy. There are now fewer than two months left until entries close for the Aurealis Awards, the awards for Australian science fiction, fantasy and horror. The deadline is December 7. Make sure your work is submitted in time. It's a super easy process. To enter, go here. I’ve been struggling with sticking to a writing routine lately, but I’ve recently joined a new write club and I’m finding this is really helping. As we were discussing today – cos we do talk as well as write – how often you write is such an individual thing, whether its daily or weekly or monthly depending on commitment etc, but the main thing is that its regular. The main thing is that is that it becomes a habit. The main thing is that it is prioritised. Okay, that’s three main things, all important. I’m starting to feel my way back into story world. I needed this. Other pluses include good company and scones. You can’t beat that. 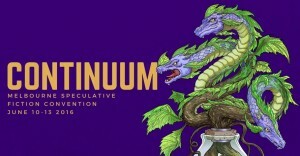 The program for this year's Continuum, Melbourne's very own speculative fiction convention, is now available from here. This year's theme is 'Stranger than Fiction' and the program is chock full of goodness.